School of Business students, Lorraine D’Souza and Jason Farley earned a second-place finish and a silver medal at the 2008 Ontario Colleges Marketing Competition (OCMC) in the Direct Marketing category - thanks, in part, to some disciplined coaching by the school’s 11 professors who gave a lot of their time to the team. The other big win in the competition was business student Angela Ravindran, who ranked fourth in the Quiz Bowl, a rapid-fire game-show style quiz that tests students’ knowledge of marketing principles. The province-wide contest, organized by Niagara College this year, covered eight marketing case studies plus a mock job interview, sales presentation and the ever popular Quiz Bowl. Centennial sent a full contingent of coaches and 22 students to take part in every category. More than 600 participants from 22 colleges competed in the events, hosted by the Sheraton on the Falls Hotel, Nov. 13 and 14. The OCMC provides students with fantastic opportunities to participate and network with professional marketers. The event is funded annually by corporate sponsors such as Yahoo!, the host college and registration fees. Helming Centennial’s team was Professor Linda Donville, who proved to be an excellent facilitator, motivator and friend to students and faculty alike. Linda teaches a variety of core subjects in Marketing and is an industry professional with a proven track record. Our team effort is made possible by the ongoing dynamism, commitment and enthusiasm of David Johnson, Dean of the School of Business, who is well known for his support of student and faculty initiatives such as the OCMC competition. The team celebrated its competition results with a closing rally and lunch on Thursday, Nov. 27 in the school boardroom at Progress Campus. Citizen Watch presented each of the students with their own timepieces as a reward for their efforts. Recruitment for next year’s team has already begun. The School of international business college will be commencing team training as early as this January to ensure 2009’s competition results are even better. Interested students can contact Linda Donville at ldonville@centennialcollege.ca. The First Generation Project, which helps sustain first-generation college students and prospective students in their efforts to reach their academic goals, marked its second year of successful outreach and academic support with a celebration at the Student Residence and Conference Centre on March 31. More than 60 students and college staff came together to congratulate each other for working through another academic year that otherwise might have been insurmountable for students with little support at home. President Ann Buller was the keynote speaker at the mixer. A First Generation student is defined as one whose parent(s) did not complete college, university or an apprenticeship program in Canada. There are more than 1,500 self-identified First Generation students on Centennial's database. "By self identifying, they have told us they are looking for a mentor and academic support as they negotiate through an unfamiliar institution, an experience their parents likely never had themselves," says Project Manager Esther Broomfield, a member of the college's Student Life Enhancement Division. "Many times they're just looking for referrals to services we offer. Guiding them is an important retention function to keep them in college." The project, funded by the Ministry of Training, Colleges and Universities, provides inclusive programming, positive social relationships and information that are fundamental to students achieving success at college and in the community. "Lunch and Learn" sessions on campus allow students to get some pointers on such disparate topics as personal finance, exam preparation, stress management and sexual health, to help them cope with the responsibilities of being an independent college learner. In addition to assisting Centennial's own students, project mentors also visit local high schools once a week to reach out to first-generation students there who also may be struggling to stay in school. Sessions at lunchtime or after school bring together younger students with first-generation college education students who know first-hand the challenges of being motivated to get good grades. Centennial's First Generation Project is designed to inspire youth between the ages of 12 to 24 years to maximize their potential through academic success and access to post-secondary education. By all accounts, the project has been well received and is making a difference. Unfortunately, the government has not committed to funding the work taking place at a number of Ontario colleges and universities beyond the initial three-year time frame. The School of Business's Play It Smart program has wrapped up after a successful year of community outreach, thanks to a tireless army of Centennial volunteers with their hearts in the right place. Play It Smart concluded on March 29 with a boisterous party involving the children and their parents, as well as student volunteers and faculty, at the Progress Campus Student Centre. Participants were treated to a dance, talent show and even a PowerPoint presentation on 9-year-old boy assembled about Play It Smart. The pilot program offered a mix of school tutoring in English, math and science, as well as some basketball instruction and house league play on the professional court at Ashtonbee Campus. The free 20-week program, which took place every Sunday morning between September and the last weekend in March, involved more than 100 children between the ages of 7 and 13, as well as Centennial's own students who volunteered their time as coaches and tutors. "For some of the kids, the carrot really wasn't the basketball," says Vern. "It was an opportunity to get some extra help in English and math. We had one young girl who was specifically interested in learning how to write well. She gave us a great speech at the final event." Each Sunday, the kids received 30 or 60 minutes of tutoring in a subject they felt they needed help in, and then the instruction moved onto the hardwood for a half-hour of basketball coaching and a half-hour of house-league play. School of Business Professor Vern Kennedy borrowed the concept from his friend Claude Nembhard, who has coached basketball to kids in North York and York Region. Centennial's participants came from the Malvern neighborhood in northeast Scarborough. The youth were bused from the Malvern Town Centre to Ashtonbee (the Progress DEL Gym is closed for redevelopment) at no cost. Vern was able to get some corporate sponsors involved, including Canadian Tire and Boston Pizza, to help defray costs. "The Student Association (CCSAI) provided the volunteers and they did a fantastic job of recruiting them," says Vern. "I can't say enough about the creativity and commitment shown by our own students, who gave up 20 Sunday mornings to work with these kids." The students were recruited from a number of programs, including Child and Youth Worker, Early Childhood Education, Police Foundations, Recreation and Business. Vern, who teaches marketing and advertising, says introducing youngsters to Centennial now will help them feel less intimidated to try post-secondary education in the future if they've already had a positive experience on campus. The outreach program is also an effective way to have Centennial become better known in the community. Vern credits the School of Business staff, including Dean David Johnson and Professors Linda Donville, Les Miscampbell and Scott Abraham for working out the logistics of the outreach project. Verns says plans are already in place to continue Play It Smart this fall, thanks to ongoing funding and support from the CCSAI and the community. Choosing to sacrifice some summer fun for an educational future, 147 local youth joined Centennial's award-winning HYPE (Helping Youth Pursue Education) program this year to sample a rich learning experience at no cost to them. The youth, aged 13 to 29, primarily from the Scarborough neighborhoods of Malvern, Kingston-Galloway and Scarborough Village, participated in six career-oriented courses - in automobile repair, food services, child studies, office administration, business entrepreneurship and esthetics - over the past six weeks. The HYPE Class of 2009 was recognized at a special graduation ceremony at the Progress Campus Student Centre on August 13. The students heard some inspiring words from keynote speaker Nation Cheong of the Youth Challenge Fund, as well as from valedictorian Sheldon Blackbourne. "I learned to smile here," Sheldon was quoted as saying in a Toronto Sun article. "I didn't understand the importance of education and finishing school. Fortunately, I've found many options through the HYPE program." Having sampled the college experience this summer, Sheldon plans to enroll in Centennial's Child and Youth Worker program this fall and become a social worker. For some, participating in the program is the first positive school experience they've had in a long time. The initiative is rooted in Toronto Mayor David Miller's Community Safety Plan, designed to bring programming to youth living in under-serviced neighborhoods of the city. Centennial worked with local community service agencies to identify youth who could benefit from the career programming. Now in its sixth year, HYPE also received a lot of positive word-of-mouth from local residents, which helped generate 220 applications for this year's intake. Thanks to a large grant - $450,000 over three years - from Michael Clemons' Youth Challenge Fund, the students were provided with free transportation, textbooks, breakfast and lunch. A generous grant from TD Bank Financial Group allowed HYPE to expand this year to include more participants and mentors, as well as additional training opportunities. Students developed individual portfolios that included certification earned in personal and skill development workshops, such as "financial literacy," presented by volunteer staff from TD Canada Trust. Participants also took part in a variety of social events. The college has expanded its bursary program, awarding each of 40 HYPE participants with a $1,500 bursary when they enroll in full-time studies at Centennial this fall. Last year's bursary winners will receive $1,000 each to commence the second year of their programs. HYPE is managed by Tony Granato and overseen by Tony Bertin, Manager, Community Outreach Office, of the Student and Community Engagement division. Some 25 Centennial staffers with big hearts came out on June 26, to pedal a big bike for the Heart and Stroke Foundation, raising a college record sum of $6,808 towards research into heart disease. The Progress User's Group established the Big Bike "Team Centennial" to raise money for the well-known charity. The team, organized by Senior Financial Officer Michelle Muscatello, assembled at Tucker's Marketplace across from the Ashtonbee Campus to ride the Foundation's famous Big Bike around the neighborhood. The weather was sunny with a sticky high of 26 degrees. Team Centennial was the top fundraising team in the Scarborough area and we are waiting to hear of our team's provincial ranking. Other local employers taking part in the event included Aviva, Cosmetica Laboratories, Wal-Mart, ULC, Leisure World Ellesmere, GE Money and Old Navy Scarborough. The total raise for the day was an amazing $21,456. Big thanks to our volunteer team members for their dedication, and thanks to everyone who supported their effort with pledges to fund a very worthy cause. Without the Big Bike, it would be difficult to raise awareness of heart disease and to discover new treatments and preventative measures for those who suffer from heart complications. 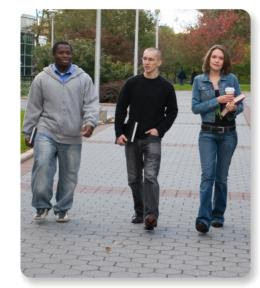 For more information about Toronto education & degree go to community college. The Big Bike is a fundraiser program by Team Centennial that helps in spreading awareness regarding heart diseases, its treatments and preventive measures as this community college is also by the name of School of Social Work. 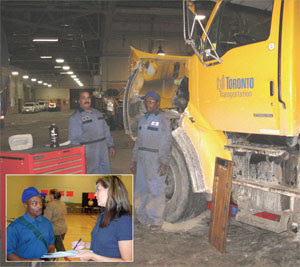 Trevor Thompson registering for the Modified Apprenticeship Program in Truck and Coach in August 2008 (inset). The larger picture shows Trevor (on the right) in his work placement with the City of Toronto (Fleet Maintenance) this past December. Trevor is thankful for the help he has received from the Ministry (Marieke Vander-Meiden) and SoT staff (Professors Thompson, Dixon and Tamburro) in pursuing his goal of becoming a licensed technician with the City of Toronto. He moved to Scarborough last year because he was interested in studying at Centennial. He started with the Con. Ed. Department by taking night courses on Steering, Suspensions and Brakes while being employed during the day at East Spring Service. When he heard about the opportunity to study full time in the Modified Truck and Coach Co-op he did not hesitate to quit his job to pursue full time studies. With a little support from EI and his savings account, Trevor has remained focused upon his goals of continuing to achieve credentials in the Transportation industry. We can expect to see Trevor around our campus for some time yet as he continues to build upon his successes by enrolling in full and part-time programs with the School of Transportation. Visit Automotive schools to find more information about your apprenticeship training. Meeting Hugh Jackman, Quincy Jones, Deepak Chopra and Donna Karan, were just some of the highlights for a recent Centennial College graduate's trip to New York City. For Kyle Surowicz, graduate of the Broadcasting and Film Program, networking with these iconic celebrities while attending a United Nations conference and at a private event at Jackman's home on that same day, was a dream come true. But the real reward came with being able to participate in something that just might change the world. "The best thing was getting involved in some absolutely amazing events," says Surowicz of his involvement in The Global Poverty Project, a presentation and forthcoming documentary similar to Al Gore's An Inconvenient Truth. "I met Hugh Jackman (best known for his recent role as Wolverine), some of the greatest political and business minds of our generation and attended a United Nations meeting that included the Presidents of Sengal, Malawi and Uganda," Surowicz says. They are all involved in some way in this UN initiative to end extreme poverty in our lifetime. Surowicz was in New York City to capture footage for an upcoming documentary that is being produced in collaboration with Australian Producer Clive Burcham and Chris Adams, formerly of Participant Media, whose projects include Syriana, with George Clooney and Matt Damon, North Country, with Charlize Theron, Good Night and Good Luck with George Clooney and Al Gore's An Inconvenient Truth. "They approached me and told me that my material, at least in their eyes, was really good and wanted to work with me again," says Surowicz of Burcham and Adams, both of whom he met via Centennial College. "Receiving recognition from serious industry heavy weights really added to my shooting confidence." The Global Poverty Project was created in 2008 by young Australian development advocate Hugh Evans, who was behind the Australian Make Poverty History campaign featuring U2's Bono. The Project aims to help the planet's poorest 1.4 billion people living in extreme poverty - defined as those living on less than a $1.25 a day. Surowicz points to his time at Centennial College as a key stepping stone preparing him for this new career. "Centennial College provided me with the tools and knowledge and helped shape my natural instincts. Natural instincts mean to always attempt to put yourself in the right spot at the right time and constantly look for new shots and ways to innovate your production." So, what's next for Surowicz? "After working with the Global Poverty Project, I can't wait for the next chance to document their journey," Surowicz says. "It has elevated me from recent graduate to industry professional in the eyes of my peers and it has given me the self-confidence and experience to build onto my rapidly growing career."